The 5-reel Lotsa Loot slots offer players two things: a big jackpot prize and lots of lucky symbols to help you win it. Click here to play! You'll want all the luck these slots have to offer, as the jackpot can be truly life changing if you hit it, often worth thousands of dollars. 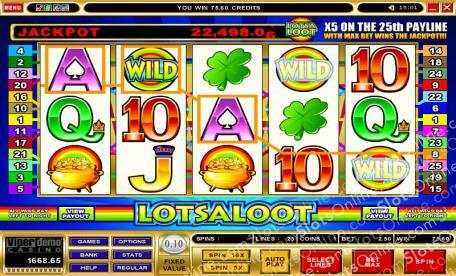 The lucky symbols of the 5-reel Lotsa Loot slots include lucky rainbow 7s, rainbow BAR symbols, a four leaf clover, and Ace, King, Queen, Jack, 10 and 9 symbols. One of the most fortunate symbols is the pot of gold, which is very encouraging to see when you're playing for a jackpot prize. If you want to play a simple 5-reel slots game that offers a big prize instead of flashy bonuses, then you should be sure to give the Lotsa Loot 5-reel slots a try. The Lotsa Loot Logo symbol is wild and it substitutes for all symbols.